Solid Tonewood Bodies Korina , Mahogany, Alder, Swamp Ash, Koa, Walnut, Rosewood 40 Choices Poplar, Ash, Alder usually topped with Maple or Koa but rarely solid. Fingerboard Choices, Ebony, Rosewood, Maple, Pau Ferro, Morado, Brazilian RW, Macassar Ebony Maple & Rosewood, occasionally Ebony on very few models. Quilted Maple Drop Tops Available. Not available just veneers. 100 different pickguard materials available on any model. Small selection and no interchangeability. Choice Of Fret Size. No. Choice of bridge, Original Pearlcaster, Tune o matic, Mann Made, PRS, Floyd, Vintage, Hardtail Very small selection. Multiple Pickup Choices, EMG, Duncan, Fralin, Fender, Lace Sensors, PRS, Dimarzio, Rio Grande. Very small selection. 1500 G neck mod standard on all models (no charge) Not available. Hand Made & Hand Signed. Machine Made on CNC Machines. Assembly, wiring, set up and initial fret job done by one man. Done by a number of different people in a number of different buildings. LSR Tuners Available. Not Available. All main parts made in USA by US Citizens (several bridges and tuners made in Germany by Schaller) ??????? All small components made in USA except some pots & switches made in Mexico & Asia. ?????????? Several companies have copied this great innovation. We have been offering this for more than 25 years. 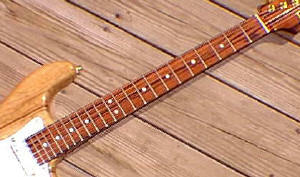 However no one is offering it on a traditional styled guitar like the Pearlcaster. What makes a Pearlcaster a better guitar than it's competitors? The simple fact that the parts are all carefully selected by Ed Roman personally and no corners are ever cut. Each Guitar is master-built entirely by one luthier, Each guitar is signed by the individual builder. From bridges to pickups to tuners to Straplocks. Nothing but the absolute best is acceptable. many competitive companies start off using the best quality parts but soon begin to cut corners by using imported bridges and cheaper tuners and generally trying to save a couple of pennies per item. 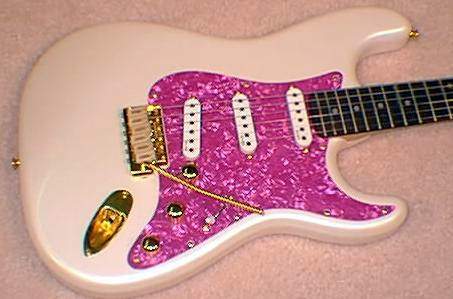 As long as Ed Roman is the owner of The Pearlcaster / Magic Twanger / Sceptre lines of guitars there will be no cost cutting. Pickups - Seymour Duncan or better. Tremolo Bridges - USA Made Pearlcaster bridge has case hardened ball bearing pivots instead of standard knife edge like everyone else. Pickguard Celluloid - Finest made brightest whites no dingy yellow shading like competitive brands. Bodies - 100% Alder, Ash, Koa, Korina, Rosewood, Lacewood. Necks - Finest Quartersawn USA Maple hand matched to each body. Fingerboards Finest African Gaboon Ebony, Finest USA Flamed Maple, Brazilian Rosewood, Madagascar Rosewood. 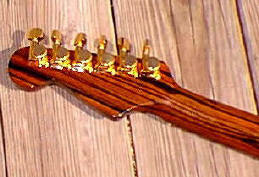 Tuners - LSR linear String Rotation, Sperzel Schaller or Grover, Absolutely no Kluson imports or Gotoh Asian Tuners. Electronics - We use the best available. currently looking for any American manufacturer who can supply pots and switching devices. Strings - Mostly Dean Markley premium strings, sometimes GHS. Nuts & Saddles - Graphtech. Fretwire - Dunlop & Sanko. Screws - Machine Screws Neck Screws, high quality plating on all component parts. currently the only imported parts on these guitars are the jack plate and the potentiometers. Ed Roman is working on changing that as soon as possible. Optional Solid Macassar Ebony Tone wood Neck and Fingerboard. Beautiful Solid Macassar Ebony Tone wood Neck. The Absolute Finest Quilted Maple, Figured Ash & Figured Walnut is available on the Pearlcaster. The Quality of Construction is Guaranteed to be the Absolute Finest Anywhere in the World. All Pearlcaster bodies are made with separate pickup chambers. And they always will be. Pearlcaster tremolos are not the traditional knife edge type that most companies use! In fact they work much more smoothly ! There is a ball bearing pivoting system built into them. Better electronics better woods & hardware. Seymour Duncan Pickups are Standard but you can specify any other pickup you like ! Unlimited Choices of Neck Body & Fingerboard Woods. Leslie West's Pearlcaster with Original 1985 PRS Mil Com Tremolo. The Original Mil Com" PRS Tremolo is not even available on PRS guitars anymore.